GUEST ARTICLE: Will Channel Nine’s much hyped takeover of Top Gear Australia from its cash strapped SBS cousins capture an audience or send an already ailing show to its TV death? Motoring correspondent Pranav Bhatt attended a Top Gear Australia filming session to find out if the new host Shane ‘Kenny’ Jacobson can resurrect Top Gear Australia. Note: Top Gear Australia starts broadcasting on Channel 9 at 730pm, Tuesday, September 28th with a “Top Gear Ashes Special”. Standing outside a hanger at Sydney’s Bankstown Airport, site of the Top Gear Australia set, I’m sure I wasn’t the only one wondering if Shane Jacobson would hit the mark hosting a series that’s already left Charlie Cox, James Morrison and Warren Brown in the rear view mirror. From what I could gauge squeezed several rows back in the male dominated audience, Jacobson provided a refreshing take on motoring, differentiating himself from his big screen persona of “Kenny” the one hit wonder plumber. But where he might match the legendary wit of Jeremy Clarkson, it wasn’t clear if he had the motoring expertise to back it up, judging by his superficial review of a $450,000 Corvette. Jacobson is joined by Ewen Page and Steve Pizzati, the sole surviving cast member from the first version of Top Gear Australia screened on SBS. Judging by the fact that the third most ‘googled’ query for Ewen Page is “who is ewen page”, it’s clear that as the Editor in Chief of the BBC Top Gear Australia magazine, Page has a lot of work to do to stamp his personality on the show. The episode was punctuated with a distinctly Australian rev head flavour. Page opened the show struggling to outmanoeuvre Sydney traffic in a V8 supercar. Somewhat predictably, the traffic, narrow windy roads and complexity of the gear shifts combined to get the better of Page. Sweeping aerial camera shots of the V8 ripping up the Anzac Bridge brought the visuals up a notch whilst Page, following in the footsteps of James “Captain Slow” May, provided some unintended comedy as he managed to overheat the engine crawling, stalling and struggling to park the V8 beast. Craig Reucassel and Andrew Hansen from the Chaser appeared as special guests, recounting their infamous near-death APEC limousine stunt. Jacobson did his best to keep the segment lively when the Chaser boys seemed to drop off. The hot lap on the test track concept seemed to spin Hansen out a bit as he even signalled for turns. Across the ditch in New Zealand, the Top Gear boys were tested in a Suburu WRX challenge on one of the most dangerous dirt tracks in the world which almost claimed the life of the Kiwi Stig (or ‘Stug’ as they jokingly referred to him in a Kiwi accent). Fans of the big budget BBC original will probably appreciate this segment best with its raw camera work and high octane feel. Returning to the V8 theme, Ford V8 driver Mark Winterbottom allowed Page to throw his championship car around a racetrack chasing a 60 second lap time. After exchanging a classic ‘don’t touch that button!’ moment with the rookie Page, things clicked into gear and Page’s confidence behind the wheel grew. Jacobson rounded off the segment handing the V8 to the Australian Stig who he described as a man that “some say when he crosses the road, cars look both ways – all we know is that he’s called the Stig”. The episode closed with a short-sharp high octane “V8 to the Rescue” studio stunt where a V8 engine was used to tackle ‘ordinary’ life situations with predictable results (much like the ‘V8 powered blender’ stunt performed by Clarkson in Top Gear UK). If I were a judge on one of the reality TV talent shows this segment would certainly score a zero for originality, probably pushing the Australian V8 theme too far. If past reactions are anything to go by, one thing is guaranteed, fans of Top Gear UK and the legions of critics of the Australian hosts and format will unite, either warming to Jacobson’s straight-talking personality and appreciating the return to a more motoring rather than tacky stunt driven format, or they’ll blame Nine for destroying the Australian franchise for good. To add to the pressure, the trio must deliver ratings fast or risk facing the axe. Channel Nine have apparently given them just six episodes to win-over the public. 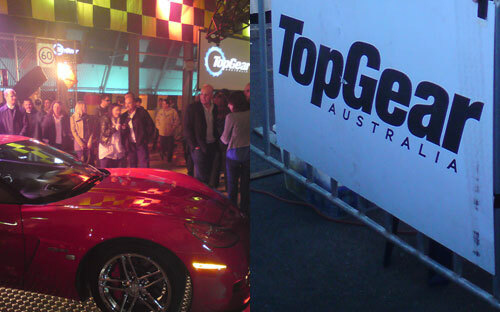 Channel Nine are yet to confirm when Top Gear Australia will go to air in 2010 – maybe October. Hope it works for them. People were way to harsh on the previous Aussie one. Have a look at the 1st season or 2 of UK Top Gear – very clumsy and awkward. Worst Top Gear though has to go to the Russian version. I went to filming for TopGear Australia tonight and thought I’d share a bit about what I saw and learned while I was there. First, I just want to get a bit of unpleasantness out of the way…. I’m afraid the rumours were true- Shane Warne is on the show. He isn’t one of the three main hosts, but he has filmed reviews in England. They showed us clips from reviews he has done of the Caparo T1 and a Morgan. I am guessing that they planned to make him a host and put him to work filming reviews right away. Then when it was leaked earlier in the year and they saw the massively negative reaction online, they decided to dump him as a host but still use the stuff he had filmed. I hope that is the case. I’d hate to think that he is permanantly part of TopGear Australia. Tonight filming was a bit confusing. Rather than simply filming an episode, the footage from tonight was for use in four episodes. I think they were doing some pick-ups of stuff that was either missed in earlier tapings or needed to be re-shot. At one point they threw to commercials telling us that Lisa McCune would be on after the break, then later they filmed a scene that ended by telling us that boys from the Chaser would be on next. The celebrity interview that was filmed tonight was Jimmy Barnes. I had a look at the lap-time board and noticed that Michael Clark, Lisa McCune and the the two Chasers were already on there. The test-track has been reconfigured into a figure of 8 and they are using an 80s-era Falcon ute with a bull-bar for the celebrity laps now. I when to the show on the 1st Oct, 10, I was not to impressed as Michael Clark was their guest, while asking Micheal what he did in time, Shane didn’t knew the time himself, how stupid of him, they had to go to a break, while at the break a crew member rush up on stage looking at he’s phone to get the lap time, next they started up again with Shane write down the time. Shane couldn’t even write Micheal Clark name right, if you look at the lap time panel he wrote over Mick to Michael!!! Anyway left the show at 7.30pm as you can hear what is said by the team, so all you are there for in rent a crew and clapping all the time. I cannot see this show will ever last. That was rubbish. If it was car for car, country for country, It might have been watchable. “Australia”. On SBS I could “take or leave it”. After seeing that I could easily leave both English and Ausie Top Gear. Rubbish, pure rubbish. Any person (stupid Pizatti) who takes both hands off the wheel while driving and talking has no place on any motoring show. Just plain stupid and irresponsible. We have just watched the third episode of TG Australia with Michael Clark and the Supercar featured. Our family loved it! If you are an Aussie revhead with testosterone for blood, I can see why you don’t warm to this relatively tame version of Top Gear, but we love it that we can watch it as a family (although didn’t appreciate Shane Jacobson’s couple Bull**its when cursing the corvette when it didn’t make the 3.3 seconds for 100km/hr)..Anyway, as far as reviews go, we have really enjoyed the first three programs and would be really disappointed should it be cancelled. Good Luck, Top Gear Australia. Top gear Australia, come on channel 9, the people in the show are good, but the old xf ford ute, punted around cones & tyres. Should have stuck to the UK format, cheap Australian car around a set track, trained by a race car driver, it’s the best part of the UK show. Watch the 1st Australian show, but will have to give the other 5 a miss. Haven’t seen any of the aus top gear series, but if you’re writing an article about it you should probably spell everyone’s names right. I’m not interested in the evolution of the British program (Michael Quinn – 15 September). It is just stupid to try to emulate such a successful program, even if Australia is full of rev heads. There isn’t enough space on the box for two shows that are essentially the same, albiet one with a local flavour. Pizatti is an out and out pretzel (thanks Shane) who should stick to cartooning. Silly, silly idea – Top Gear Australia, even if it is successful elsewhere. One can only hope it has been axed, but you’re right, it took Nine to stuff it. It was never going to work with a bunch of people we had never heard of, and who had no history together. Good riddance. It might also give Pizatti a chance to think about the image he projects to the younger audience members – so many of them are impressionable and don’t need a “no hands on the wheel while driving” presenter to further their instinctive bullet-proof mentality. Come on we cannot expect TGA to live up to expectations. Before captain slow “James May” the fat man was boring. Reviewing car prices, what a bore. Now the characters complement each other. While taking the piss out of each other. We Aussies need to lay off on the criticism. Its easy to poke holes, how can we expect them to compete with the budget that the original Top Gear would have now they are at season 16. The presenters held their own when the went up against Clarkson, Hammon, and May in their own territory. Top gear is a light hearted motoring show, I don’t even watch it of the car’s. My interest is the challenges. It makes me laugh and top gear Australia did that. With the new host, “kenny” they are on the right track. The original is more of a comedy then serious documentary. Any one else got any suggestions? Honestly I always loved the British version of this show.. Some how it just felt right.. The now have a version of it in the states and honestly it just killed the whole concept for me because i feel like I’m watching a bunch of clowns playing with cars. Would love to check out an episode of the Aussie version to see how it compares to the other two versions I’ve seen..